Janet Kruskamp's Paintings - Articles and Reviews about Janet Kruskamp's paintings. "Janet Kruskamp 'My works arouse feelings!'" California Today, San Jose News Sunday Magazine, June 10th, 1973, Author Ted Bredt. Southwest Art, June 1975, Author Janice Lovoos. San Jose Mercury News Sunday Magazine, July 11th 1976, Author Ted Bredt. Northlight Magazine, February 1979, Author Janet Kruskamp. San Jose Magazine, June/July 1979, Author Susan Thomas. San Jose News, April 1980, Author Wes Peyton. Los Gatos Weekly, April 25th 1990, Author Leslie Vestrich. Los Gatos Weekly-Times, Jan 8th 1997, Author Shari Kaplan. Art Expressions, February 2003, Author Robert Sher. WASHINGTON UNIVERSITY ART MUSEUM, SEATTLE WASHINGTON. 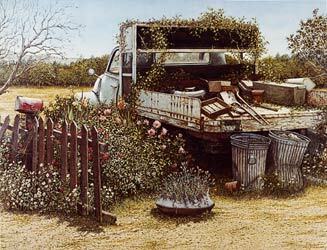 "Kruskamp is a realist painter in the old tradition. She excels in details of aging nature and man’s constructions in it (such as old fences, dilapidated chairs, and rusting metal) which have aged so long outdoors they have become a part of it. Her’s is not wild nature. It is the backyard with wildflowers, the orchard at the edge of the lot, the pea patch, the sun scortched hill where cattle graze. She shifts freely between egg tempera and oils, achieving her finest effect with tempera. Tempera produces enamel like surfaces which will not discolor with age as oils may . . . The white gessoed surface reflecting through the pigment gives luminosity, a quality of glowing light to finished paintings. One feels one can look down into the layers of paint. Kruskamp makes optimum use of its qualities in studies of light and shadow-bits of dried hay scattered confetti like over a barn floor, the sun reflecting against old metal, or being absorbed into weathered barn boards. Her brand of romantic realism extends even to a study of thistles growing up under rusting railroad tracks, focusing, as many of her studies do, on a common place and often overlooked facet of nature, and showing it to be beautiful." “…Mirrors are for viewing the present and looking over the shoulder at the past. Janet Kruskamp sees both in her oil and egg tempera paintings at the Springville Art Museum. These are not sentimental accounts of American life distorted by vague recall. Her brush, like a mirror, begins with new and lines up in good perspective a sense of yesterday. Inspired in part, no doubt, by the recent Bicentennial celebration, the canvases take on the task of finding the utilities that make up a great nation. The Los Gatos, California artist who traveled more than 25,000 miles in search of America, has a perceptive eye and hand.